2 1-5 In the same way, my brothers, when I came to proclaim to you God’s secret purpose, I did not come equipped with any brilliance of speech or intellect. You may as well know now that it was my secret determination to concentrate entirely on Jesus Christ and the fact of his death upon the cross. In myself I was feeling far from strong; I was nervous and rather shaky. What I said and preached had none of the attractiveness of the clever mind, but it was a demonstration of the power of the Spirit! Plainly God’s purpose was that your faith should not rest upon man’s cleverness but upon the power of God. 6-8 We do, of course, speak “wisdom” among those who are spiritually mature, but it is not what is called wisdom by this world, nor by the powers-that-be, who soon will be only the powers that have been. The wisdom we speak of is that mysterious secret wisdom of God which he planned before the creation for our glory today. None of the powers of this world have known this wisdom—if they had they would never have crucified the Lord of glory! 9-10a But as it is written: ‘Eye has not seen, nor ear heard, nor have entered into the heart of man the things which God has prepared for those who love him’. But God has, through the Spirit, let us share his secret. 10b-12 For nothing is hidden from the Spirit, not even the deep wisdom of God. For who could really understand a man’s inmost thoughts except the spirit of the man himself? How much less could anyone understand the thoughts of God except the very Spirit of God? And the marvellous thing is this, that we now receive not the spirit of the world but the Spirit of God himself, so that we can actually understand something of God’s generosity towards us. 13 It is these things that we talk about, not using the expressions of the human intellect but those which the Holy Spirit teaches us, explaining things to those who are spiritual. Paul uses his own ineptitude in preaching to the Corinthians, as proof that God works through human sincerity rather than worldly wisdom or eloquence. I can add to Paul’s witness, as I’ve preached the gospel for fifty years, often with poor understanding, often with inadequate preparation, yet I know people who have been strengthened and encouraged by it. I can say with Paul, that God’s purpose was that their faith should rest on divine power rather than human wisdom. That’s not to say that God could have done without either Paul or myself. 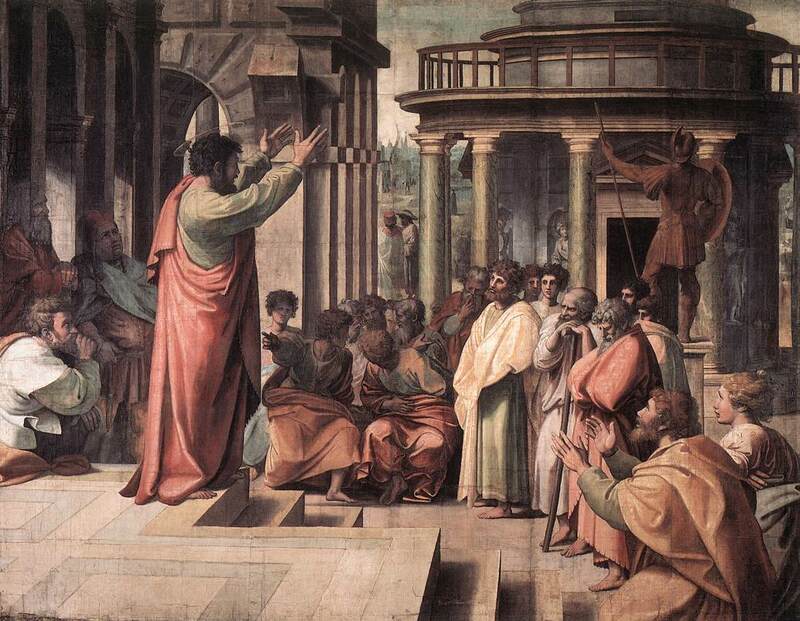 Paul’s readiness to journey into unknown places to announce the gospel, my less courageous willingness to do so in Scottish parishes, have been essential to God’s desire that people should know his love. Or at least, that’s what Paul and I say. Others might say that we’ve invented a God, or received someone else’s invention of a God, which allows us to see our preaching as more than just our own thoughts being foisted on others, part of God’s plan for the world. And yes, of course, we do rely on the experience of our predecessors in faith, and yes, of course, the God we preach is a product of our human thought, experience and imagination. Much of it however stems from the life of a historical person, Jesus of Nazareth, the memory of whom is contained in our Bible. For Paul, this memory was made available by the original disciples of Jesus. For me, by the bible and the history of the church. Our imagination of God is dependent on what we know of this man, as well as what we know about this world and our life in it. We believe that what we imagine and preach inadequately, points beyond our best efforts to One who cannot be described directly and who refuses to annihilate his creatures by his unveiled presence. That’s why he needs the best efforts of his preachers. When Paul refers to human wisdom he does not mean the ordinary products of human thought, from mathematics to “War and Peace”, but rather any kind of arrogant thinking which claims to have final truth. The real word of God is by definition inadequate: it does its job when it points beyond itself to God’s love. Humility is its necessary precondition. Humility towards God, that is; towards men and women, it can be as robust and challenging as Jesus or St. Paul. The wisdom of which Paul approves comes from identifying with Jesus Messiah and therefore sharing his relationship or “spirit” which he shares with God. The spirit is not a supernatural substance but a relationship, a mutuality with the Creator, in which a human being can understand something of God’s goodness and become its channel into the world. This is a wisdom which the worldly person ignores because s/he cannot understand it.